Tumors of salivary glands constitute 3% of neoplasms of the body. Clinical signs and symptoms usually occur in tumors at advance stages. Dynamic-contrast-enhanced and diffusion-weighted MR sequences have been described as useful diagnostic tools in other locations. Our goal is to evaluate the utility of these techniques for parotid tumors. We retrospectively reviewed the Parotid tumors operated by our department whit Dynamic-contrast-enhanced and diffusion-weighted MR sequences between 2012 and 2015. We correlate the results with the final histopathological diagnosis. From 44 parotid tumors studied, Warthin tumors were the most common (43%). They showed high enhancement and high washout in perfusion series, so as low ADC values. Pleomorphic adenomas (41%) are hyperintense tumors in T2, with moderate constant enhancement in perfusion and high Apparent Diffusion Coefficient values. It is not possible to establish consistent results for malignant tumors given their underrepresentation in this sample. Advanced MRI techniques contribute to the differential diagnosis of parotid tumors. Perfusion is useful in diagnosis of Warthin tumors and Pleomorphic adenomas. There is greater overlap in other tumors, for which diffusion-weighted MR sequences can help in discriminating malignancies. Both malignancies and Warthins show low Apparent Diffusion Coefficient values. Tumors of salivary glands constitute a wide spectrum of pathologies in maxillofacial area with an overall incidence of 3%. Around 80% of these lesions occur in the parotid gland, whit an overall incidence of malignancies of 20% at those glands . A proper diagnosis is critical in treatment and prognosis of this patients. Clinical signs as an accelerated growth, infiltration of adjacent tissues and facial palsy orientated to a malignant disorder, but this happen in less than 10% of patients with malignancy. Fine needle aspiration biopsy is a useful technique in its differential diagnosis. It helps in the differentiation of most benign tumors offering high specificity, but low sensitivity for detecting malignancies . Several image techniques, such as Echography and CT, may help in the study of the lesions, but MRI is now the modality of choice in evaluation of suspected salivary gland tumors . Owing to its great contrast resolution and multiplane facilities, MRI can clearly identify exact location and extent of the lesion, as well as its relationship with neighbouring structures. However, it is reported that margin, internal texture and signal intensity are not optimal factors to discriminate Benign Parotid Lesions and Malignant Parotid Tumors . MRI dynamic sequences such as DWI and DCE can provide additional information. They help in differential diagnosis of malignancy, delimitating the mass for its further treatment. This indication has been evaluated for other locations with good results . Our goal is to evaluate the utility of these techniques for parotid tumors. 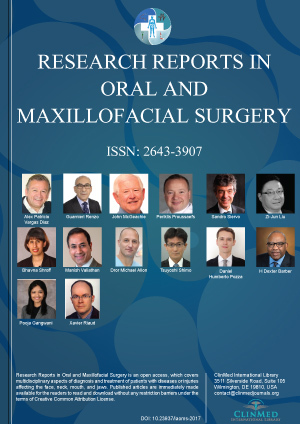 We reviewed retrospectively the Parotid tumors operated in our Hospital by the department of Maxillofacial surgery between 2012 and 2015 with a total of 44 cases. The results obtained in the MRI were correlated with the histopathological diagnosis. MRI examinations were performed with a 1.5T system (Signa; GE Medical System, Tokyo, Japan) using a phased-array head and neck coil. In all cases, the MRI protocol included conventional sequences with 3 mm section thickness: T1 weighted imaging sequence, a T2 weighted imaging sequence and a T1 weighted imaging sequence after contrast injection. The contrast agent injected was 0.1 mmol/Kg of gadobutrol (Gadovist®). DWI was performed with an echoplanar SE sequence with two b-values (0, 800). ADC values were obtained. Dynamic MR imaging was performed by using a gradient echo T1 sequence with fat suppression (LAVA). 24 acquisitions of 12 seconds scan time each were performed (total acquisition time 5 minutes). MR imaging were sequentially obtained before and every 12 seconds after contrast material administration. Time-intensity curve (TIC) patterns were categorized as follows (Figure 1): Type I (slow and progressive rise), signal increase less than 20%; type II (moderate and progressive rise), time to peak was more than 120 seconds and signal increase 20% or more; type III (early rise with moderate contrast wash) time to peak less than 120 seconds, signal increase 20% or more and less than 30% of washout ratio; and type IV (early rise with high contrast wash), time to peak less than 120 seconds, signal increase 20% or more and washout ratio more than 30%. A total of 44 patients shown in Table 1 (24 males and 20 females); age 48.46 +/- 17.0 years (mean + standard deviation) with pathologically confirmed primary parotid lesions were included, consisting of 41 benign and 3 malignant lesions. Of the malignant entities there were three histological diagnosis: Mucoepidermoid carcinoma of high grade, Myoepithelial carcinoma of high grade and Squamous cell carcinoma (Table 1). The most prevalent Benign Parotid Lesions were Warthin tumors (n19), pleomorphic adenomas (n18) and Oncocytomas (n2). Conventional MRI was available for all patients, and all of them also underwent DWI and DCE-MRI, respectively. All MPTs demonstrated enhancement after intravenous injection of contrast agent. The MRI characteristics of enhancement, ADC value and TIC type were analyzed. DW-MRI ADC values for distinguishing among tumor types (Table 2). The highest mean ADC values were observed for the 18 pleomorphic adenomas (1.942 × 10-3 mm2/s), while the lowest ADC scores were observed for the three malignant parotid tumors (0.97 × 10-3 mm2/s). The ADC values for Whartin tumors was 1.046 × 10-3 mm2/s. We considered peak time of 120 s to be the optimal threshold because it most accurately discriminated between pleomorphic adenoma and other tumors. Next, we evaluated the WRs of all tumors. The optimal WR threshold was considered to be 30%, as this value most accurately discriminated carcinomas from other tumors. Using these thresholds, we classified the TICs into the following four types as we previously described. Differential diagnosis of salivary gland tumors by time-signal intensity curve Table 3 shows the classification of the 44 salivary gland tumors based on TICs. All pleomorphic adenomas but 2 (16/18) showed Type I pattern, whereas Warthin tumors were either Type III (5/19) or Type IV (14/19). Two oncocytomas were Type III (2/2). All carcinomas but 1 (2/3) showed Type III pattern. By contrast, the other case (a squamous cell carcinoma) showed a Type II pattern. The pleomorphic adenomas presented in majority of cases (83.3%) a TIC type II pattern, characterized by moderate and progressive rise. Pleomorphic Adenomas are hyperintense tumors in T2 sequences, type II curves and high levels of ADC. On other side, Whartin tumors presented a TIC type III (26.3%) and type IV (63.2%) and low levels of ADC. Of the 44 tumors, 3 were malignant tumors. One was a squamous cell carcinoma with type II curve and low levels of ADC. The other two were a mucoepidermoid low grade carcinoma squamous cell carcinoma and a Myoepithelial low-grade carcinoma both with type III curves and low levels of ADC. Secondary to its low number of cases it was not possible to establish a correlation in malignant tumors. Low levels of ADC with hypointensity in T2 and ill-defined margins in MRI should avoid us about malignancy. Diagnosis of salivary gland tumors is critical in their treatment plan. Superficial parotidectomy, and other techniques which respect the facial nerve, are the most usual interventions for resection of the tumor with margins. In the case of malignancy, surgery sometimes has to include elective neck dissection in high-grade and high-stage tumors and resection of the facial nerve if its involved . FNAB of the parotid gland is a minimal risk, fast and effective procedure that help the surgeon to distinguish between malignant and benign neoplasia's. Even so, the role of FNAB remains controversial in the preoperative study of parotid lesions. FNAB offers the possibility to risk-stratify patients and avoid surgery in those cases where it is not appropriate or unnecessary. Moreover, in patients where a benign pathology is suspected on FNAB, the facial nerve should be preserved. The sensitivity and specificity of FNAB in distinguishing neoplastic from non-neoplastic disease in the parotid gland is reported to be between 79% and 100%, and between 71% and 100% respectively. The sensitivity and specificity of FNAB in distinguishing between benign and malignant neoplasia is between 33% and 100%, and between 67% and 100% respectively . There are several difficulties to differentiate benignity and malignancy, or to define tumor grades due to insufficient specimens, sampling errors and the subjective opinion of the cytopathologist. Variability in diagnostic accuracy varies with operator experience and geographical location . From these data, it is apparent that FNAB is a useful clinical tool with greatest benefit when performed by experienced operators and interpreted with all other clinical information. Secondary to its high contrast enhance, its great resolution and possibility of stablishing the relationship of the facial nerve with the nearest structures, MRI is the best radiologic technique in salivary glands diagnosis. Several MRI findings suggestive of malignancy in salivary gland tumors have been reported. These include ill-defined margins, infiltration into adjacent tissues and low signal intensity on T2 weighted images. Low to intermediate signal intensities on T2 weighted images reflect high-cellularity. The ill-defined margin reflects the invasive growth of tumor cells . Classic MRI techniques result in considerable overlap between benign and malignant tumors in terms of imaging appearance. Christe, et al. reported that the sensitivity and the specificity of the conventional MR images findings in predicting malignancy were 70% and 73%, respectively. As a result, the validity of conventional MRI in the differential diagnosis of salivary gland tumors is restricted. In the last decades, the roles of functional MRI, such as DWI and DCE-MRI, have been assessed in head and neck neoplasms to improve this overlap between benign and malignant tumors. The ADC, a quantitative parameter measured from DW-MRI, combines the effects of capillary perfusion and water diffusion in the extracellular extravascular space. Precise measurement of ADC is of great importance because it has been used to differentiate malignant from benign tumors , to discriminate malignant lymphomas from carcinomas , and to follow treatment response of squamous cell carcinoma of head and neck . In malignant neoplasms, water molecule diffusion is restricted resulting in low ADC values compared with benign lesions. However, controversy exists in clinical application of DWI in differential diagnosis of parotid lesions. Eid, et al. performed DWI in 31 patients with salivary gland tumors resulting in 97% accuracy, 100% positive-predictive value and 96% negative predictive value. Celebi, et al. revealed that an ADC value of 1.165 optimizing the sensitivity and specificity (63.3% and 71.9% respectively) of DWI for distinguishing the parotid malignancy. In the present study, we found significantly lower ADC values for malignant parotid tumors (0.97 × 10-3 mm2/s) than those for benign lesions (1.46 × 10-3 mm2/s). DCE is a functional MRI sequence that may help the accuracy in diagnosis of parotid tumors. Differential diagnosis of salivary gland tumors by time-signal intensity curve, specifically, whereas peak time was most commonly defined as the time required to reach maximum tumor enhancement after contrast material administration. Yabuuchi, et al. defined it as the time required to reach 90% of maximum tumor enhancement. The threshold of peak time that discriminated between malignant tumors and pleomorphic adenomas also varied among the studies and included 120, 165 and 210 s. We considered peak time of 120 s to be the optimal threshold because it most accurately discriminated between pleomorphic adenoma and other tumors. Furthermore, the definition of Wash Rate (WR), which represents the degree of signal intensity decline at a certain time point after contrast material administration, also differed among the studies. Although some studies defined WR at 5 min after contrast administration, others defined it at 3-4 min. The WR thresholds reported in past studies include 10%, 20%, 30% and 40%. Furthermore, the optimal threshold of WR at 5 min was 30%, and this most accurately discriminated between malignant and Warthin tumors. Due to these parameters, we could find four different patterns, which has been previously reported. In our study, all pleomorphic adenomas but 2 (16/18) showed Type I pattern (Figure 2), whereas Warthin tumors were either Type III (5/19) or Type IV (14/19) (Figure 3). Two oncocytomas were Type III (2/2). All carcinomas but 1 (2/3) showed Type III pattern (Figure 4). By contrast, the other case (a squamous cell carcinoma) showed a Type II pattern. Dynamic MRI Studies such as DWI and DCE contribute to differential diagnosis of Parotid tumors. Perfusion is useful in the diagnosis of Warthin tumors and Pleomorphic adenomas, there is greater overlap in other lesions, for which the diffusion can help in discriminating malignancies. Both malignancies and Warthins show low ADC values. This fact together with hypointense signal in T2 and poorly defined margins should alert us of the possibility of malignancy. Louis B Harrison, Roy B Sessions, Merrill S Kies (2014) Head and Neck Cancer-A multidisciplinary approach. (4th edn). DH Mallon, M Kostalas, FJ MacPherson, A Parmar, A Drysdale, et al. (2013) The diagnostic value of fine needle aspiration in parotid lumps. Ann R Coll Surg Engl 95: 258-262. H Kato, M Kanematsu, H Watanabe, K Mizuta, M Aoki, et al. (2014) Salivary gland tumors of the parotid gland: CT and MR imaging findings with emphasis on intratumoral cystic components. Neuroradiology 56: 789-795. T Tartaglione, A Botto, M Sciandra, S Gaudino, L Danieli, et al. (2015) Differential diagnosis of parotid gland tumours: Which magnetic resonance findings should be taken in account? Acta Otorhinolaryngol Ital 35: 314-320. Schaefer PW, Grant PE, Gonzalez RG (2000) Diffusion-weighted MR imaging of the brain. Radiology 217: 331-345. Jatin Shah, Snehal Patel, Bhuvanesh Singh (2012) Jatin Shah's Head and Neck Surgery and Oncology. Que Hee CG, Perry CF (2001) Fine-needle aspiration cytology of parotid tumours: Is it useful? ANZ J Surg 71: 345-348. Schmidt RL, Hall BJ, Wilson AR, Layfield LJ (2011) A systematic review and meta-analysis of the diagnostic accuracy of fine-needle aspiration cytology for parotid gland lesions. Am J Clin Pathol 136: 45-59. Espinoza S, Halimi P (2013) Interpretation pearls for MR imaging of parotid gland tumor. Eur Ann Otorhinolaryngol Head Neck Dis 130: 30-35. Christe A, Waldherr C, Hallet R, Zbaeren P, Thoeny H (2011) MR imaging of parotid tumors: Typical lesion characteristics in MR imaging improve discrimination between benign and malignant disease. AJNR Am J Neuroradiol 32: 1202-1207. Eida S, Sumi M, Sakihama N, Takahashi H, Nakamura T (2007) Apparent diffusion coefficient mapping of salivary gland tumors: Prediction of the benignancy and malignancy. AJNR Am J Neuroradiol 28: 116-121. Ichikawa Y, Sumi M, Sasaki M, Sumi T, Nakamura T (2012) Efficacy of diffusion-weighted imaging for the differentiation between lymphomas and carcinomas of the nasopharynx and oropharynx: Correlations of apparent diffusion coefficients and histologic features. AJNR Am J Neuroradiol 33: 761-766. Kim S, Loevner L, Quon H, Sherman E, Weinstein G, et al. (2009) Diffusion-weighted magnetic resonance imaging for predicting and detecting early response to chemoradiation therapy of squamous cell carcinomas of the head and neck. Clin Cancer Res 15: 986-994. Celebi I, Mahmutoglu AS, Ucgul A, Ulusay SM, Basak T, et al. (2013) Quantitative diffusion-weighted magnetic resonance imaging in the evaluation of parotid gland masses: A study with histopathological correlation. Clin Imaging 37: 232-238. Yabuuchi H, Matsuo Y, Kamitani T, Setoguchi T, Okafuji T, et al. (2008) Parotid gland tumors: Can addition of diffusion-weighted MR imaging to dynamic contrast-enhanced MR imaging improve diagnostic accuracy in characterization. Radiology 249: 909-916. Francisco Merino Domingo, Oral and Maxillofacial Department, Hospital 12 de Octubre, Calle Rafael Salazar Alonso 20, 28007, Madrid, Spain, Tel: 0034-654650430. © 2018 Merino DF, et al. This is an open-access article distributed under the terms of the Creative Commons Attribution License, which permits unrestricted use, distribution, and reproduction in any medium, provided the original author and source are credited.